Survival is a bag of tricks all themed around the outdoors. It should be considered one of the most valuable skills in the game, especially in campaigns that take place mostly in unexplored wilderness. It is particularly valuable to the Ranger as it synergies with both Favored Enemy and Natural Explorer but is a solid pick for any character. Tracking is detailed in the Dungeon Master’s Guide on page 244. Essentially, the DC of the Wisdom (Survival) check is based on the terrain and how well tracks would show up on it. There is a table for ease of use (and I highly suggest DMs memorize the page number or write this table out) that shows DCs and modifiers for how old the track is. It also gives recommendations on when to call for a new check. As far as navigation is concerned, unless you are following a path or road your DM should be calling for checks to make sure you aren’t getting lost. Survival is the skill you use to determine this, and again the Dungeon Master’s Guide provides details starting on page 111 about becoming lost and wilderness navigation. The DCs are based on the terrain, with modifiers based on being able to see stars to navigate with or having a map. The recent adventure, Tomb of Annihilation, also has rules and discussion about navigation that might be useful in the context of it’s hex map and rolling a check each day. Other than navigation and tracking, Survival also is useful for recognizing certain wilderness hazards or situations; it is also used for hunting and gathering food and water. As mentioned in the PHB, the DM might call on a roll to recognize the tell tale signs of some beast or it’s nest. Many of these sorts of rolls are dependent on the DM and adventure. Perception – Recognizing or spotting a hazard, tracks, or other hard to perceive object or situation is in the realm of Perception. Essentially: in a situation where seeing tracks has a chance of failure, Perception is called for. To recognize that something is a track and to follow said tracks, Survival is called for. Most of the time, however, noticing the tracks isn’t the problem, following them is. Nature – There is some overlap of these two skills that is hard to ignore or rectify by the rules. For example, in the PHB description of Survival it mentions using it to avoid wilderness hazards like quick sand. However, in the DMG, the skill given to avoid these hazards is Nature. In instances like this it is your job as the DM to make a arbitration. My method would be this: to spot the hazard to begin with would be a perception check (or passive perception if no one is actively trying to see it) unless it is obvious, and to figure out how to avoid it I would allow either Nature or Survival in most situations. If I were feeling less generous, situations where I’d call for Nature instead of Survival would be to recognize a species of dangerous plant like razorvine or a poison flower. Situations I’d call for Survival would be to recognize thin ice, a slippery surface, or quick sand. My assumption is that the contradiction shown by quick sand is a mistake in the book. Animal Handling – Neither Nature or Survival deal at all with trying to engage socially or behaviorally with animals. Nature might tell you more about a certain animal, and Survival might tell you how to avoid the animal and its nest or to recognize signs of its passing, only Animal Handling is used for direct animal engagement. Survival has a wide range of uses as a skill in 5th Edition Dungeons and Dragons, equivalent in my eyes to combining multiple skills together. It is one of the more useful skills, I would put it up there with both Stealth and Perception as a skill that will never not be a solid choice. The following is an optional way of using Survival and navigation in your game. Ryuutama is a japanese RPG made by Atsuhiro Okada and translated into english by Kotodama Heavy Industries. The focus of the game is on travel, and the rules for doing so are pretty neat and helps to bring what might be a simple check into the game as a story component. Using those rules as a guideline, I have come up with a similar set of checks for use in 5th Edition Dungeons and Dragons. This is meant as an amateur fan hybridization and I do not claim to own any of the rules or mechanics of Ryuutama (or D&D for that matter). It is entirely unplaytested. Use the following rules whenever the PCs are traveling off road in the wilderness between places of civilization like towns or cities. Each day, they will make a series of roles to determine how effectively they are navigating the area. Keep in mind the rules in D&D for travelling speed and pace. 1 – Travel Check: If not traveling on a road, the entire party rolls a either a Strength (Athletics) check or a Wisdom (Survival) check to determine how well they travel over the terrain during the day. The DC for this is dependent on both the terrain and the weather, as shown in the table below. Anyone that is exhausted, diseased, injured, or otherwise in a state unfit for travel as determined by the DM has disadvantage on this roll. If half or more of the party passes, they travel for the day with no trouble. If they fail, they encounter a hazard appropriate for the terrain they are traveling in. These hazards should be more dangerous based on the DC of the terrain, being anything from tripping over a root and twisting an ankle to nearly plunging down a hidden chasm. Alternatively, you can use this to initiate an encounter instead. Either way, those who failed the roll should be immediately involved with the hazard or be given disadvantage on perception checks or checks to avoid it. In the event of an encounter, they should be considered surprised. Conquering the hazard is based entirely on the hazard itself. Attempting to go around, if possible, should add hours to the journey. The hazard need not even be dangerous and could instead add flavor to the area and to the journey. A failed roll in the grasslands, for example, might simply mean coming across a stream you must wade through that runs down a hill atop which sits a ruined tower. It could mean the wagon wheel getting stuck in mud and as the party attempts to get it out a traveler comes along and helps (or hinders). 2 – Direction Check: If not traveling in familiar territory, after the travel check and it’s consequences have been resolved, the navigator of the party should roll a Wisdom (Survival) check to determine how accurately they direct the party. Consult table 3 below to determine the DC for this check, and consult the weather and conditions table (table 2) above to determine any DC modifiers. If the party is moving at a slow pace, the navigator gains a +5 bonus to the check, and a fast pace imposes a −5 penalty. If the party has an accurate map of the region or can see the sun or stars (weather dependent), the navigator has advantage on the check. On success the navigator successfully leads the party in the direction they wanted. However, on a failure, the party is lead off course. They travel 1d6 hours the wrong way before realizing it. Upon realizing, the navigator may try again. To determine in what direction they traveled, roll 1d8 and consult the table below (re-rolling if the correct direction was the result). During this check a character that is not the Navigator may attempt to find food by also making a Wisdom (Survival) check using the DCs from table 3 and the modifiers from table 2. On success they are able to provide enough food for the day for the whole party without consuming rations. When deciding to camp for the night, the party must find an appropriate place to shelter and sleep. One person in the party must make either a Wisdom (Perception) check or a Wisdom (Survival) check to locate such a place. The DC for this roll is based on the previous two tables (Tables 2 and 3). The person making the check gains disadvantage if anyone in the party lacks suitable sleeping equipment for the conditions and weather. On a success such a place is found and the party can take a long rest and set watch as normal. On a failure, however, the party can either spend another hour searching for a better spot or camp in the sub-par spot. Camping in the sub-par spot will cause each PC to have disadvantage on their Travel check during the next day. Finally each PC must consume 1 waterskin worth of water and 1 days of rations before the next day of travel. Failure to do one or the other will give a level of exhaustion to the PC. Rainy or snowy weather or being near a source of fresh water (determined by the DM) can provide water without needing to drain a waterskin, and can be used to fill any empty waterskins. You should allow the PCs the chance to do other things between the checks as normal. These aren’t meant to be a series of sterile dice rolls and should instead be used interspersed with the action and role-play of travel. As the DM it is your job to narrate the results of these roles into the context of the game. It might be a good idea to have a number of hazards and encounters already prepared if you have a hard time thinking on the fly. This slows down the pace of a normal game of D&D. Only use it if you are all right with this, and remember that travelling in familiar territory requires no rolls. Travelling along a road also cancels any need for rolls, though you might call for a direction check if a fork or side road comes along. Consider rewarding or punishing for critical successes and failures. A critical failure on a travel check might result in an environmental hazard AND a dangerous encounter. A critical successful camp check might provide you with a spot that gives advantage on perception checks to anyone trying to approach. I want to thank every person that has given me feedback on this series. Though this is the last entry, I will continue to go back and edit as needed using feedback or wisdom gained playing the game. Expect soon an index page as well where I will link them in alphabetical order to use as an easy bookmark. I’ll also end that index with a small discussion about the series, why I wanted to do it, and what I learned in the process. Feedback for this series or anything on this blog is both welcomed and solicited with gusto. 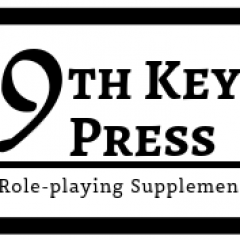 Content creator for 9th Key Press.